This is my husband Carleton Curtis modeling a double crochet yarmulke for your crafty Hanukkah pleasure. This Double Crochet Yarmulke Pattern is done in rounds, so mark your first stitch of each each round with a different color yarn or a marker so you don’t forget where you started. This is my first crochet pattern so I know it probably needs improving, please leave me a comment and let me know if it needs changing! And enjoy this holiday crochet craft for Handmade Hanukkah! Can you please put his name in this post ten times so that this picture comes up when you google his name? please? You are the most fun ever. I can't wait til tonight! Will Carleton Curtis be there or will he have already left? Lookit me, I'm famous! But Scarlet is a lot easier on the eyes. Carleton Curtis will be here for One Night Only! Don't worry there will be plenty of Carleton Curtis time for you. I know you want to see Carleton Curtis and Carleton Curtis wants to see you, so it's really great that Carleton Curtis will not be leaving until Friday! ha, in google Carleton Curtis on Prudent Baby is number 20. so I have to say Carleton Curtis a few more times. CARLETON CURTIS! Kerrie! I knew I forgot something, thank you. I used a size 8 needle and 4 oz yarn. The gauge is 4 1/2 stitches per inch! 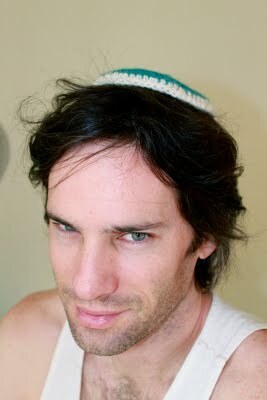 what a cute yarmulke,I love the color! nice job! hope to see more of your work and please post more patterns! This particular Dual Broche Yarmulke Design is completed within units, therefore tag initial sew of every every circular having a various colour wool or perhaps a sign which means you do not overlook to began.